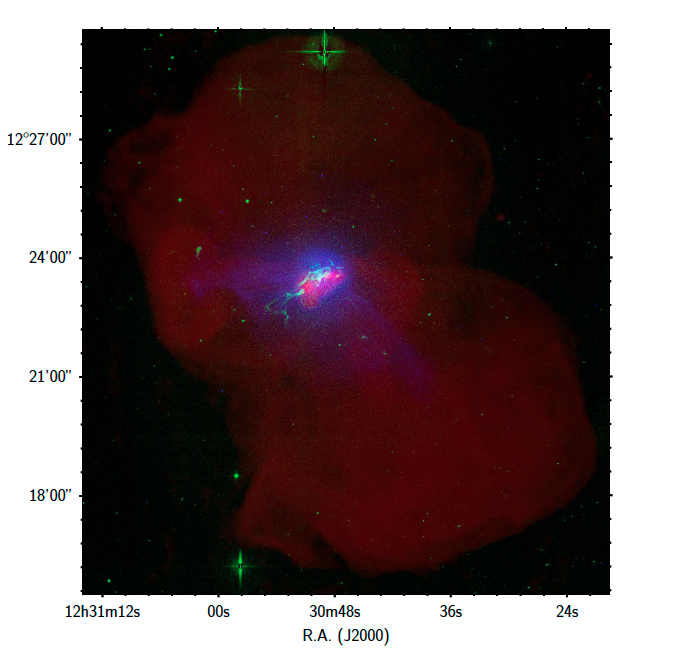 In a publication recently accepted in Astronomy and Astrophysics, an international team involving French researchers from the Laboratoire d’Astrophysique de Marseille and Canadian researchers from NRC Herzberg and Queens University have studied Malin 1, a nearby galaxy that has been known only since the eighty's and that shows an extremely large disk of gas and stars. The new observations of Malin 1, a prototype of the class of "giant low surface brightness galaxies" allowed the team to obtain new results in contradiction with one of the hypotheses concerning the formation of this type of galaxies. Because they are very diffuse and of low surface brightness, giant low surface brightness galaxies, yet massive, are difficult to observe and are still poorly known. They could represent a significant percentage of the galaxies in the universe, especially because we could have missed such objects in our galaxy surveys. It is thus important do study them and understand their formation and evolution. This is now possible owing to the new generation of telescopes and modern detectors, with higher sensitivity to low surface brightness than in the past. Left:The curve with the errorbars shows the variation with radius of the color between 2 GALEX bands (FUV and NUV). A blue colour indicates the presence of young stellar populations. The blue and red curve shows the model used in the paper. It is in agreement with the observation. 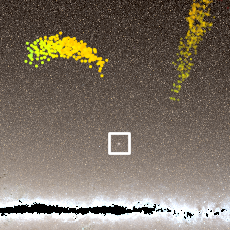 On the other hand, the yellow line show the color of stars that would have been formed during a interaction 1.4 billions year ago, or a star formation event that would have expanded from the center in the distant past to the outer regions in the more recent period (stars). The expected colors for this model do not fit the data. Right: History of the star formation rate (SFR) in the the giant disk of Malin 1 according to the model that reproduces correctly the stellar surface density and the colors of the galaxy. 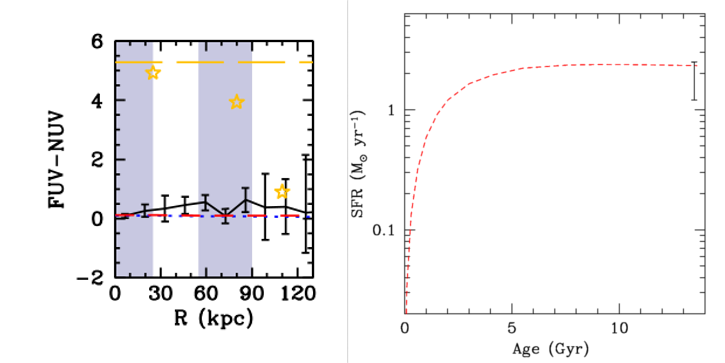 This history suggests that star formation proceeded at a regular rate for several billion years (the error-bar indicates an estimate of the recent SFR published in another study). Figures adapted from Boissier et al. 2016. This paper presents for the first time deep images obtained at 6 different wavelengths, from the UV of the GUViCS project to the optical and near-infrared obtained in the context of the Next Generation Virgo Survey with MegaCam on CFHT. Originally, these large observational campaigns were planned to study the Virgo cluster, but they also allow us to study background objects like Malin 1. The images offer us a new view of this spectacular galaxy, the largest galactic disk known, with a diameter above 250 kilo-parsec (in comparison, our Milky Way is only about 30 kpc wide). The team of researchers extracted from these data the variation of the luminosity with the distance to the center of the galaxy, as well as the variation of the colors (corresponding to the ratios between the luminosity at various wavelengths). These colors strongly depends on the star formation history. The comparison of the observations with predictions of various numerical models allowed the team to estimate for the first time what must have been the history of star formation in the giant disk of Malin 1. It suggests that the giant disk has been in place for several Gyr, and that star formation proceed at a regular long-term rhythm despite the very low density. This result is important as it clearly contradicts a scenario proposed a few years ago predicting that these giant galaxies are formed during violent interactions. Moreover, in the context of the cosmological formation of galaxies, numerous fusions and interaction should have perturbed the disk of Malin 1. The formation of such a structure and its survival for very long time offers then a challenge for cosmological simulations of the formation of galaxies. What is the future of Malin 1? The giant disk contains a large quantity of gas in which star formation will keep proceeding at a low rate for billions of years, increasing progressively the stellar mass of the galaxy. Unless another galaxy comes in the picture to interact with Malin 1 and totally change its destiny. Few galaxies, however, may play this role as Malin 1 is a relatively isolated galaxy. Official press release from INSU (in French). Laboratoire d'Astrophysique de Marseille (AMU, CNRS).